NEW! Future Cornerstones – Featirng the most highly coveted prospects across all levels of MiLB #’d to 99 or less! (1:Case!). Look for Orange (#’d/25) and Black (#’d/1-of-1) parallels! 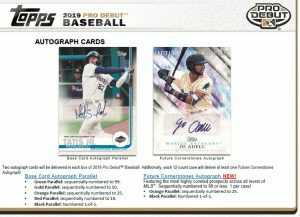 Fragments of the Farm – The popular subset returns to feature unique pieces of MiLB memorabilia! Distinguished Medallion Cards – Commemorating the most prolific debuts of the game’s stars with a commemorative medallion piece. Sequentially numbered to 99. Promo Night Uniform Relics – Showcasing JUMBO Swatches of game-used jerseys originating from popular promotional nights across MiLB! Sequentially numbered to 99. NEW! Jumbo Patch Relics – Showcasing JUMBO patches of game-used jerseys! Sequentially numbered to 15. Look for AUTOGRAPH parallels #’d/5. 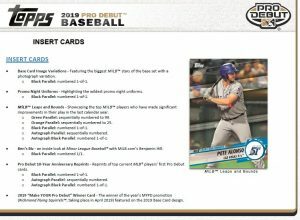 ALL relic sets will future colored & numbered parallels! Base Card Image Variations – Featuring the biggest MiLB stars of the base set with a photograph variation. Promo Night Uniforms – Highlighting the wildest promo night uniforms. MiLB Leaps and Bounds – Showcasing the top MiLB players who have made significant improvement in their play in the last calendar year. Ben’s Biz – An inside look at Minor League Baseball with MiLB.com’s Benjamin Hill. 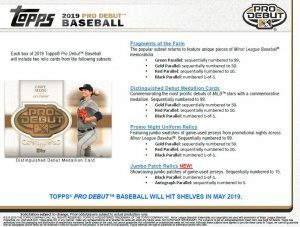 Pro Debut 10-Year Anniversary Reprints – Reprints of top current MLB players’ first Pro Debut cards. 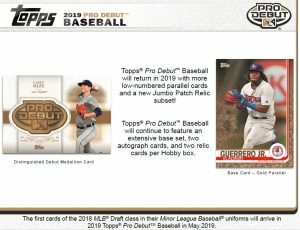 2019 “Make YOUR Pro Debut” Winner Card – The winner of the year’s MYPD promotion (Richmond Flying Squirrels, taking place in April 2019) featured on the 2019 Base Card design. 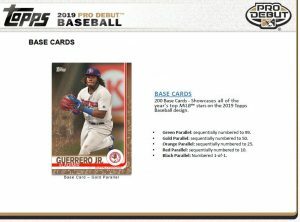 200-Card Base Set showcases all of the year’s top MiLB stars on the 2019 Topps Baseball design.